New Year, New Resolutions: Museum Conservation Conversations on the UCL PACE Museums and Collections Blog! The PACE Conservation Laboratory on UCL’s Bloomsbury Campus serves the needs of UCL’s diverse collections. The objects we have examined and treated in 2015 have ranged from fragile inorganic and organic archaeological materials, small sculpture and other works of art, dry- and fluid-preserved zoological specimens, all manner of scientific teaching models, an array of mechanical and electrical scientific instruments, and much, much more!! Faience ‘shabti,’ during treatment: Petrie Museum of Egyptian Archaeology (UC20989); Bronze medal: UCL Art Museum (10026); Mammoth tusk: Grant Museum of Zoology (Z2978); Mathematical model: UCL Maths. These objects have come to our Conservation Lab from UCL’s collections for a variety of reasons. Some need to be cleaned or repaired ahead of use in teaching, research, loan or display. Some present mysteries which close examination and scientific analysis may help unravel. Others have been selected for treatment as part of ongoing programmes to improve the condition of collections currently in storage. Each object has a story to tell, and with the start of this New Year, we have made a resolution to share the work we do with our blog audiences. Our Conservation team consist of myself and Emmy Kingham. At the moment, we are also enjoying the company of Young Woo, a full-time, 2nd-year placement student from the UCL Institute of Archaeology’s MSc Conservation for Archaeology and Museums. Young is with us for another 7-months, developing practical experience in treating and documenting a variety of objects under our guidance. 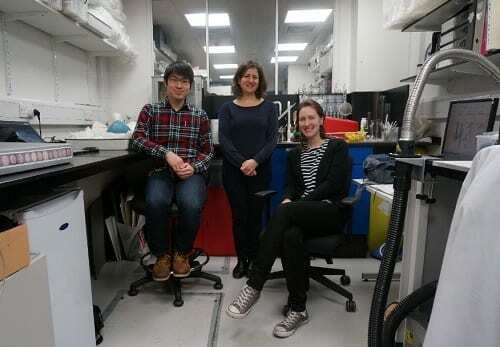 The UCL PACE Conservation team, from left to right Young Woo, Susi Pancaldo and Emilia Kingham. So: to start off the New Year, we’ve set ourselves the enjoyable task of sharing our highs and our lows, trials and tribulations, joys and angst as we carry out our work, caring for the fascinating collections we are lucky enough to have here at UCL. Look out for our bi-weekly conservation posts!